Water problems in Mississauga basement are a health problem as well as a nuisance. Periodic flooding renders the basement unusable. Water cannot be controlled, just managed. Our approach is to waterproof the basement foundation of your Mississauga home from the positive side with a protective drainage board. Exterior foundation waterproofing in Mississauga is the preferred method of waterproofing a basement foundation, preventing water from entering the basement from the exterior. The effected area of walls are excavated from the exterior, cleaned and prepared for waterproofing material. For small projects, Bakor WP200 waterproofing membrane is applied to the primed foundation wall. Over top of the membrane is a water drainage and protection board is applied, Bakor WP 2000 These Bakor basement waterproofing products are the very best on the market and come with a manufacturer's warranty. Weeping tiles are either a clay tile or plastic pipe that extends around the base of the foundation footing to collect any water that accumulates. The weeping tile is connected to either a sewer or a sump pit, today all new Mississauga homes have sump pits and pumps. After installing the waterproofing and protection board, the weeping tile are inspected and checked to ensure they are functioning. If the weeping tiles are not functioning, a high water pressure contractor is called in to flush out the weeping tile around the Mississauga home. Click here to contact us or call 1-888-610-4959 today for a basement waterproofing or foundation waterproofing estimate in Mississauga. The closed interior waterproofing system is a state of the art method for controlling water from the interior with no excavation on your Mississauga home. Without a proper seal, moisture will leech back into your basement providing no solution to your problem. The completely sealed system protects against groundwater minimizing moisture and the entry of harmful gases into the basement. The system draws water from both outside walls and the basement center, where the water is then directed into the drainage trench. In addition, the complete seal reduces the presence of bugs and rodents. Should it be necessary the system is completely accessible to ensure years of efficiency. Cochren Foundation & Repair offers the Number 1 Interior Basement Water Control System. - This system is the only closed system offered. By closed we mean that the water never enters into the home. A sealed flame retarding membrane is applied from the top of the interior foundation wall down and over the footings. A specialized drainage tile is installed below the basement floor to collect any water that runs down the basement foundation wall. This drainage tile is connected to the sump pit and pumped out with the sump pump. The benefit of this system is no water or moisture is emitted to the basement environment. Installation takes about two days. 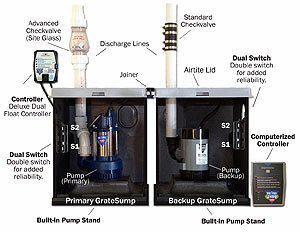 Cochren Foundation & Repair installs the most revolutionary sump pit and pump manufactured in North America. The 1/3 horsepower pump is the most energy efficient, controlled with not one but two switches for more reliability. After every use, the backwash goes directly to clean the propellers to prevent it from clogging. The sump chamber has a built in pedestal to raise the pump above the bottom where all the sediments lay that could otherwise clog the sump pump. The chamber is only 16" deep to prevent undermining the basement foundation allowing it to be installed close to the basement foundation wall. The level and secure lid makes it safer without impeding on basement floor space. It is important to keep the humidity in your basement below 45% relative humidity. While this may be possible in the winter with the furnace running, it is not so easy in the summer. Unless you have a means to control moisture, you may be fighting a losing battle against mold and mildew in your home. We have the most advance dehumidifier on the market today! Why Cochren Foundation is the right choice for your Mississauga Basement Waterproofing project? 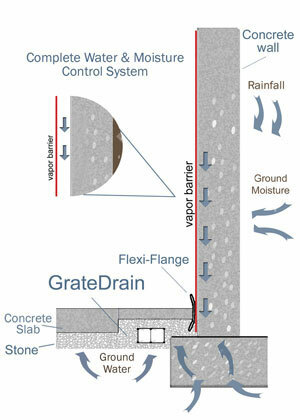 We'll be more the happy to answer any questions you may have about basement waterproofing in Mississauga. Contact us today find out if basement waterproofing or a foundation waterproofing is suitable for your Mississauga home. Use our Contact Form or call us toll free at 1-888-610-4959 today to discuss how waterproofing your basement can add durability and value to your house in Mississauga.